Fedora is a traditionalist distribution. That means its packages and desktop are as close to the default as you might expect from a distribution that isn't Gentoo. Its KDE desktop is particularly interesting, because there are none of the niceties like a customised menu or re-themed panel that you'd expect from a more KDE-centric distribution. You get the original KDE experience, which isn't always a great thing. If you're coming from the world of Windows, KDE isn't all that easy to pick up. It may look familiar, with a launch menu, widgets and virtual desktops, but it takes some serious re-adjustments. The system control panel, for example, is a mess of OS X backwards/forwards panels, hidden windows and dozens of checkboxes. Fedora makes no attempt to tame this complexity, whereas openSUSE brushes over some of these cracks with its own configuration panels. The default desktop environment is equally uncompromising. Most users will only persevere with this desktop if they know what to expect. On the desktop, Plasma is unadulterated – you get just the basic file widget. This is the virtual representation of what's in your 'Desktop' folder, or any other folder you'd like it to point at. This is one of the big ideas behind what KDE used to call the Plasma desktop – a brave attempt to tie the internet and the world of social networking to your OS. Fedora's default gives none of this away. 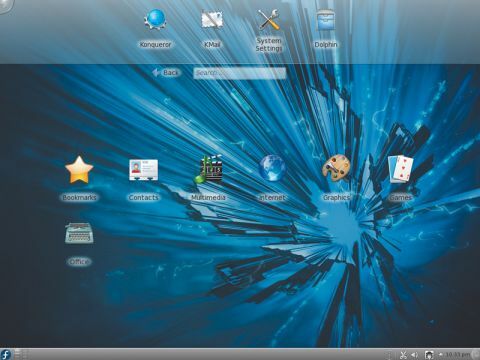 Instead, you'll need to click the Plasma cashew icon, adding widgets to your desktop and panel. Only then does the desktop start to feel more advanced and progressive than a Windows 7 installation. The addition of Activities is the best example of KDE's innovation, and it would be great if a distro like Fedora was brave enough to realise its full potential.